This week’s carnundrums cover Historic events, penalty culture, griller wars, cleaning up, splashing out, changing gears and more to divert your attention from the weekend’s chores. I want to buy a sports car both to enjoy and as an investment in my retirement. The two main contenders are an Austin Healey 3000 and an entry-level six-cylinder E-Type. My budget is £70k, top-whack. But several people have urged me to go for an Ariel Atom. I’ve done track days (car and motorcycle), so I appreciate speed. But as important as enjoyment is that the car must hold or increase its value. I know it’s difficult to advise where personal preference is very important, but do you have any views or advice on this? I have been reading about private parking penalties. What would happen if one went into a car park, but found no spaces, then drove out again? Surely you could not be fined. This happened to me once in a hospital carpark. It became gridlocked with drivers looking for spaces and the only way you could pay was to park, then go into an office and buy a ticket, which you couldn't do if you couldn't park. Catch 22. I just pushed my way out behind another car at the barrier, but you would not get away with that these days. They would issue a penalty and you would have to appeal it. If the case went to court it would depend on the Small Claims judge. A friend arrived with a Bentley. Upon closer inspection, it was a large Chrysler rebadged. He tells me that this is legal, as he has seen lots of these cars being sold in the USA. Is this correct? Not rebadged. Just a Chrysler 300C with a radiator shell and mesh grille that looks like a Bentley's. Having battled a misbehaving diesel engine in my previous car (duff injector), and now a warning light on the dash of my present car, I threw in a bottle of STP injector cleaner when I filled up this afternoon and drove a few hundred miles to my next appointment. On restarting the engine a few hours later the warning light is gone and has not returned during my drive home. However, I am now worried that I've just masked out the issue in the short term. I think the injector cleaner has cleaned up the fuel system. If I were you I'd make a permanent switch to superdiesel such as Shell V-Power, BP Ultimate, Total Excellium, etc. because they have injector cleaning additives as part of the formula. My wife and I have a 10-year old Honda CR-V automatic, which we bought when I retired and are now thinking of replacing. We have no real need for a 4x4 but bought the present one because my wife was having some difficulty in getting in and out of the rather low seats in the saloon car that we had at the time (a VW Bora). In addition, I found any seating position where my legs were stretched out in front of me whilst driving, rather than being partly downwards in a more normal sitting position, gave me severe back pain after a few miles. We would like a smaller car, but at our ages, the main requirement is the seating position. Are you aware of any cars other than SUVs that might meet our requirement? The best small and tall cars were the Suzuki Splash and Vauxhall Agila, but both have been out of production for some years. Instead of SUV you could think MPV and a Ford B-Max Powershift might suit you, though there has been some transmission trouble. Alternatives include the Hyundai ix20 and KIA Venga autos. 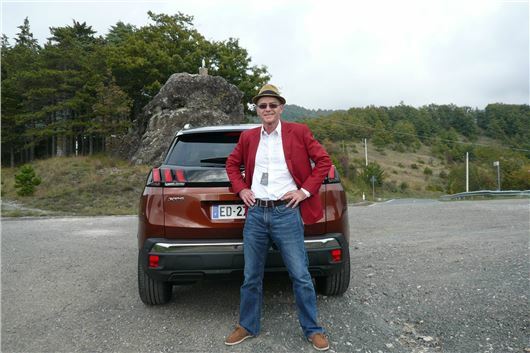 Smaller automatic SUVs include the Peugeot 2008 1.2 Puretech 110 EAT6 and the Suzuki Vitara S 1.4T BoosterJet. My 2005 Skoda Superb 1.9TDI auto gearbox has packed in. My mate who runs his own garage, has intimated it might be possible to convert it to a manual. He would be prepared to undertake this if he knew exactly what it entailed, provided it's possible. Anything is possible if you are prepared to meet the cost. But it is neither cheap nor straightforward and will probably require a new engine ECU as well as all the other components. Our daughter is pregnant and already has a young child. She does a series of long journeys, including busy motorways. She has a 2006 Honda CR-V diesel, manual, which she bought new. It has done 100,000miles and has been serviced annually. On three occasions recently it has just lost power, without the engine cutting out. She sits by the road, juggling the throttle and eventually it starts to respond; she then pulls away and it returns to full power. This is a terrifying situation. She took it to her usual Honda main dealer and they plugged their laptop in and drove it with the laptop plugged in and said they couldn't find anything wrong. She was told to bring it in when it was doing it. Help. I'm desperately worried, and so is she. It sounds like fuel to me, but I don't know. One final question: if it has to be replaced, what vehicle of similar style would you replace it with? I appear to have received conflicting advice from my local VW dealership, which has recently changed hands. Under the previous ownership I was told that my 2006/56 Polo 1.2 64PS has a chain cam-drive which does not require regular replacement. But I have been advised by the new service department that it has a toothed belt that should be changed, together with the water pump, every 40,000 miles. Which is right please, or am I confusing two different components? This will be a 3-cylinder 1.2 Polo and will be chain cam (count the spark plugs). The later 4-cylinder Polo 1.2TSI became belt cam. I’d find a more competent garage. In January 2012 I purchased for my wife a 2010 VW Polo 1.6 TDI 3-door with 11,000 miles on the clock. It has now done 56,000 miles. For the past 2 years the car does not always run well. Sometimes clouds of black smoke come out of the exhaust, the engine judders and misfires and there is a loss of power. It eventually clears and the car then runs smoothly. I never use supermarket fuel. My local garage has done diagnostic checks, that don’t show anything. They replaced a DPF pressure sensor on 20-10-2016. I am still waiting for VW to take the car in for the recall. I’m a little bit disappointed in VW cars. This year I have had both window cables replaced as they broke, and a spring on the front offside. Any thoughts on this car's performance, or what I should do? It probably needs a new EGR. Many EA189 1.6TDIs do. VW dealers typically demand around £1,000 for the job and deny it's anything to do with the emissions defeat software modification. I have yet to hear of any 1.6TDIs actually being recalled because it's a bigger job than with 2.0TDIs, requiring hardware as well as software modifications. The job hasn't worked with at least 20 2.0 TDIs and 1.2TDIs that I have been notified of. I have a 2013 BMW 318i petrol, bought second-hand with 58k miles. It ran beautifully for the last 12 months, though I only do around 6,000 miles a year. The service indicator has now shown up. Is it okay for me to wait another four months (as I have to watch the pennies)? Or do you recommend I book it in now? My standard recommendation is oil and filter change every 10k miles or every 12 months, whichever comes first. In fact I get the synthetic oil and filter in our own car changed every 10,000 kilometres, which works out at about every 4-5 months. It's now done 108,000 kilometres and is running beautifully. Oil changes are the best value maintenance anyone can do on any car. I am looking to upgrade my 2008 Ford Focus next year, l test-drove a 1.5 Mondeo Ecoboost automatic and, although relaxed, it lacked get up and go. I am wondering if the 2.0 litre petrol would be the same, or is the TDCI better? I do mainly city driving and my mileage is less than 10kpa for now. In that case, compare it to the Mazda 6 6-speed auto. You could also take a look at a Jaguar XE that has the Mondeo 2.0 EcoBoost engine with 200PS or 240PS and comes with a 6-speed manual or (much better) 8-speed auto. Give me a low spec XE over a high spec Mondeo any day for similar money. Thank you for your response to my question about buying or taking a company car in which to travel 500 miles a week. Does it make a difference that my 500 miles is for commuting to a single place of work, so will be classed as private mileage rather than business mileage? Doesn't make any difference these days. You are simply taxed on the benefit of having the car. And if it's a company car you can benefit from the fuel economy of a diesel without having to worry about things like DPFs, EGRs, DMFs and all the things that start going wrong with diesels after 3 years or so. But still check this weeks’ Cancellor’s Autumn statement because changes are afoot. I drive a 2008 Honda CR-V, which hasn't missed a beat in four years and is pretty economical to run. I tow a caravan and will be changing it soon for a bigger one. The CR-V isn't heavy enough so the car has to be changed first. I want something reliable and reasonable to run. I know it'll be more expensive than the Honda but have to be sensible. I hear horror stories about Discos, Range Rovers and X5s but are they really that bad? XC90s and Touareg look a little better, or what about a Nissan Navara or the like? Anything else suitable? I only have around £22k to spend and the new caravan has a max weight of 1,723kg so the car will have to weigh at least 2 tons to fall near to the recommended 85% ratio advised by Caravan Club. Your thoughts, recommendations or warnings would be much appreciated. As long as it doesn't have to be auto, go for a post 2010 KIA Sorento 2.2 R-Type or a Hyundai Santa Fe 2.2 R-Type. The manuals can tow 2,500kg and running solo will manage 40mpg at 70; 35mpg at 80. If the owner has been changing the oil every year despite just 5,000 miles that means it's been a 3rd or 4th car or a car owned by someone who only visits the UK occasionally. I'd say very probably okay. Having test-driven a Skoda Octavia Estate I see exactly what the Telegraph road test means by “fidgeting firm low-speed ride.” It was on 17-inch wheels and I would go for the standard 16-inch ones, but do you think that opting for the Dynamic Chassis control at £850 and using 'comfort mode' would make the ride noticeably more compliant? I own a Hyundai i10, which had its second annual service today. There are 15,000 miles on the clock. I was advised that the aircon needed gassing up, and was quoted £210 for this. The reason for the high price was a switch to a new gas. I feel it was an attempt at a total rip off, on top of the high price I paid for a service by the main dealer. Do you have any suggestions as to who can do this at a reasonable price? For environmental reasons, manufacturers are being encouraged to switch over from cheap R134A refrigerant to R1234YF, which is much more expensive, more flammable and more prone to leak. Peugeot/Citroen and Nissan have already done so. From your experience it looks like Hyundai has too. An international conference ratified this about 3 weeks ago. Regarding the 1.6TDi VW engine in AJ's Polo. I ran the same engine in a Touran with the 7 Sp DSG. The EGR valve failed after 2 Years, a known weakness, followed by the EGR coolant sensor, then another coolant sensor, then finally an ABS sensor, all known issues, but all fixed under warranty. While it never broke down, it was getting stressful waiting for the next failure, so sold it and bought a RAV4 Petrol Hybrid last week. Stay away from this VW diesel, the diesel gate recall will probably make it worse as they have to modify the air mass sensor mesh! Go petrol but not a VW one as new ones will have a Particulate Filter fitted!